Below is an excerpt transcribed from a recent conversation between hedge fund manager and MacroVoices podcast host Erik Townsend and Hedgeye CEO Keith McCullough. Erik Townsend: Keith, as I look to Slide 26, I see a sea of color here moving from red on the left side to green on the right side. That must be a good thing. What’s the important thing to be watching? Where are the areas of concern on this chart? Keith McCullough: For people that don’t do rate of change, this is a quick way to get caught up. To your point, Erik, when it’s all red it’s bad. When it goes from red to amber, it’s less bad. When it goes to yellow, it’s not so bad. And then, when it goes green, it’s obviously good. And when it’s bright green it’s really, really good. And, as you’ll note here, the aggregate of the US economic acceleration really culminated in the bright green Q3 of 2018. 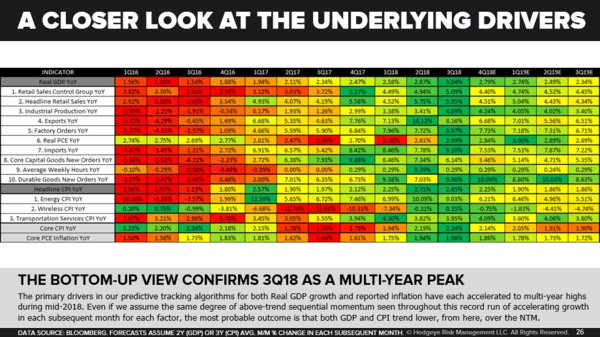 But, really, you can see color coding it by Q2, Q3 of 2019, we’re back to yellow lights. And that’s – if you’re going to just see one picture and then line up the ducks on the biggest components of GDP and inflation, which is basically what we’re showing here, the real point is that the probable outcome is that we slow. Now that’s when I make calls. When the probable outcome is something that Wall Street is not positioned for, I want to, obviously, take that position. So, again, if the lights were to change, Erik, – and you know how I do this. If the lights were to change in Q4 and Q1 of 2019, if they were to go bright green again, I reserve the unalienable right to change my mind and freedom to change my position. So this is a good example of how I use data dependence in its pure intensity to make decisions. Keith: A lot of these slides come from – we have a lot of institutional investors as clients and they ask us, obviously, very good questions. So you’re asking the right questions. People will say, okay, look, aren’t these tariffs inflationary? And the answer is yes. But are they inflationary in dollars? China represents only 22% of US imports. First of all, when you start doing the math you start to come to some more specific conclusions as opposed to political or ideological ones. And, really, the dollar’s strength right now is offsetting any inflationary impact from tariffs. Again, when you show somebody what imports are on a reported basis, you have to report those in dollars. And the reality is that the dollar in Q1 of ‘18 was down 7% year-over-year. Now, as you go into Q1 ’19, the dollar’s going to be up 7%. That’s a 1,400 basis point delta. Even if you fully tax all of Chinese imports, the full 25% that was bandied about, you still wouldn’t have inflation in dollars. You know, like how you report it. So that’s why it hasn’t really bothered me. On Slide 28, we kind of get into the wage inflation component. Those are the two big things, Erik, that people ask about. Actually we’re bullish on wage inflation. We’ve had the highest wage inflation estimates on Wall Street all year long. So that’s easy. But it’s harder for people to say with tariffs and with wage inflation how do I get a forward outlook of falling inflation? 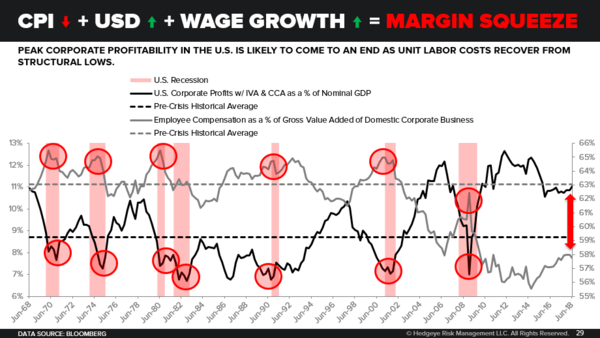 Well, falling headline inflation is actually quite consistent with rising wage growth, because wage growth is the last thing in the economic cycle to go up. And anybody who hasn’t studied that hasn’t studied cycles. 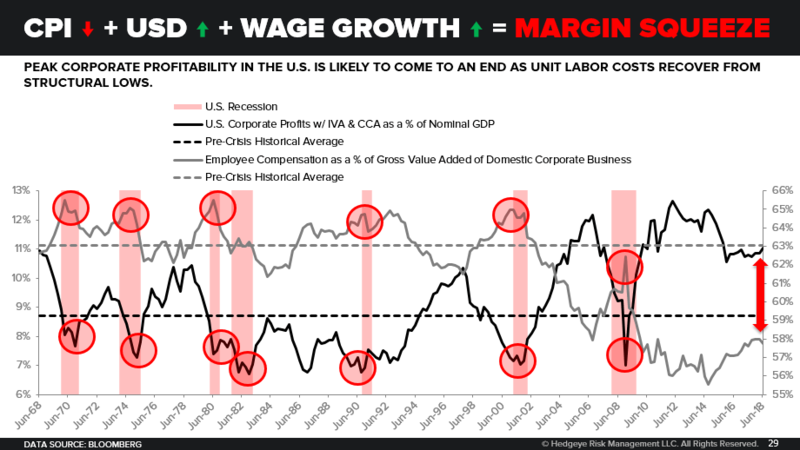 On Slide 29 you can see that too where we show you – headline inflation, which is CPI, it goes down, the dollar is going up, and wages are going up. And you get a margin squeeze. I don’t know if you’ve looked at this chart before, Erik, but in red bars you have the recessions. And the grey line is wages. Wages always accelerate into a recession. They perpetuation a recession. So the Fed sits there and they’re too hawkish too late. Wages are rising. They’re tightening policy. And, lo and behold, you end up getting a big red bar and that’s predominately driven by rising wages and falling profits. One perpetuates the other, as you know. Erik: Moving on to Slide 29, you’re talking about a margin squeeze. I’m assuming that’s a profit margin squeeze and not a margin interest, as in borrowing on margin squeeze. How does this fit into the story? A lot of people have said, we’ve got great profits. Why would they be squeezed suddenly? If you take this down to the studs on slide 30, what we’re showing here are the rate(s) of change – and classically, or at least from our perspective, this is all we look at is rate of change. Your real earnings growth had accelerated in something like technology – fourth row from the bottom in this chart – to 32% growth in Q2 of ‘18. That was the top. So, actually, if all you did was, as a bottom-up investor, pick stocks that had accelerating earnings growth in your tech stocks, you crushed it. But then if you didn’t sell them when the slowdown began at the end of the third quarter in the current reported season to 26.6%, and then it’s going to be lower in the quarter after that and the quarter after that and the quarter after that, then you’ve got body bagged. You don’t want to do that. So it’s not about the level of earnings growth. It’s about the rate of change of earnings growth. And we’ve proven this out empirically. At the end of the day, not enough people understood or believed this into the end of the summer-time. But now they’re starting to ask the right questions on whether or not rate of change slowdowns in earnings can perpetuate broadly lower stocks. The reality is on Slide 31, 100% of the time that’s what happens. 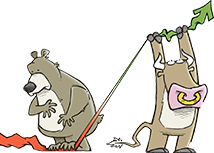 This is showing you the operating margin for the S&P 500 and the three tops you could have bought stocks at before you got body bagged – getting body bagged isn’t very good – when the margins go down the stocks go down. And even if you only look at this coming out of the 2015 top of the S&P’s operating margins to the 2016 low, the average decline in there, Erik, was 38% in the Russell 3000. Like the broadest swathe of US stocks The average decline by stock was 38%. So I think that this sucker is going down. This red line is going down. The easiest way to make it go down is the dollar going up, first. Secondly, it’s wages. So, really ,Slides 29, 30, and 31 they go together. And there is no case to be made in US stock market history – which is different than US economic history. US economic history, everybody is like, oh my God, until you tell me there is a recession then I’m not going to be scared. And then, by the way, guys like me are going to tell you to buy stocks during the recession. Because that’s what you do. You buy stocks after this red line on Slide 31 goes down. And that’s just a fact. I don’t know how anybody could debate it at this point.